The Bücker Bü 131 "Jungmann" (Young man) was a German 1930s basic training aircraft which was used by the Luftwaffe during World War II. After serving in the Kaiserliche Marine in World War I, Carl Bücker moved to Sweden where he became managing director of Svenska Aero AB (Not to be confused with Svenska Aeroplan AB, SAAB). He later returned to Germany with Anders J Andersson, a young designer from SAAB. Bücker Flugzeugbau GmbH was founded in Berlin-Johannisthal, in 1932, with the first aircraft to see production being the Bü 131 Jungmann. While it was Bücker Flugzeugbau's first production type, the Bü 131A was the last biplane built in Germany. It had two open cockpits in tandem and fixed landing gear. The fuselage was steel tube, covered in fabric and metal, the wings wood and fabric. It first flew on the 80 hp (60 kW) Hirth HM60R. In 1936, it was followed by the Bü 131B, with a 105 hp (78 kW) Hirth 504A-2. Most wartime production for the Luftwaffe was by Aero in Prague. Sturdy and agile, the Bü 131A was first delivered to the Deutscher Luftsportverband (DLV). The Bü 131B was selected as the primary basic trainer for the German Luftwaffe, and it served with "virtually all" the Luftwaffe's primary flying schools during the war, as well as with night harassment units such as Nachtschlacht Gruppen (NSGr) 2, 11, and 12. Yugoslavia was the main prewar export customer; "as many as 400 may have found their way" there. She was joined by Bulgaria with 15 and Romania with 40. A Japanese Kokusai Ki-86A in 1945. A still flying Spanish built CASA 1.131. Production licenses were granted to Switzerland (using 94, 88 built under licence to Dornier), Spain (building about 530), Hungary (which operated 315), Czechoslovakia (10, as the Tatra T 131, before war began), and Japan, the last of which built 1,037 for Army with Hatsukaze power as the Kokusai Ki-86 and 339 for the Imperial Japanese Navy Air Service (IJNAS) as the Kyushu K9W. In Spain, production continued at CASA until the early 1960s. The Jungmann was retained as the Spanish Air Force's primary basic trainer until 1968. In the 1960s and early 70s the Spanish, Swiss and Czech governments sold their Jungmanns to private owners many being exported to the United States. About 200 Jungmanns survive to this day, many having been fitted with modern Lycoming O-320 (150 hp) or O-360 (180 hp) four cylinder engins with inverted fuel and oil systems for aerobatic flight. In 1994, the Bü 131 was restored to production briefly using CASA jigs by Bücker Prado in Spain, with 21 aircraft constructed as the BP 131, while SSH Janusz Karasiewicz in Poland also started production of a version of the Jungmann based on Czech plans in 1994. After the deceased Janusz Karasiewicz the Polish company Air Res Aviation continues the production of the Bücker Jungmann. 20 were manufactured in Poland in 1994-2000. Improved version, powered by the more powerful Hirth HM 504A-2 piston engine. Wooden airframe version to relieve scarce supplies of strategic materials. Czechoslovakia, pre-war licence production in Tatra Kopřivnice. Mass-produced in Aero factory in occupied Czechoslovakia during wartime under original Bücker Bü 131B designation, used postwar with original Hirth engine. Czechoslovakia, postwar development with a Walter Minor 4-III engine, 260 built. Pre-production modern Polish version, powered by 78 kW (105 hp) Walter Minor 4-III engine. Four built from 1994. Main Polish production version, with 103 kW (138 hp) LOM M332AK engine. First flew 1995. 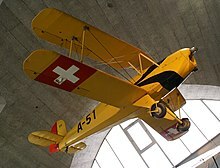 A Swiss Air Force Bü 131 B. ^ a b c d e f g h i j k l m n o p q r s t u Ketle and Rolfe 1996, p. 12. ^ a b c Jackson 2003, pp. 344–345. ^ Strona firmy Air Res Aviation Sp. z o.o. ^ Bridgeman 1946, p. 158. Bridgeman, Leonard. “The Bücker Bü 131B “Jungmann”.” Jane's Fighting Aircraft of World War II. London: Studio, 1946. ISBN 1-85170-493-0. Jackson, Paul. Jane's All The World's Aircraft 2003–2004. Coulsdon, UK: Jane's Information Group, 2003. ISBN 0-7106-2537-5. Ketley, Barry, and Mark Rolfe. Luftwaffe Fledglings 1935-1945: Luftwaffe Training Units and their Aircraft. Aldershot, GB: Hikoki Publications, 1996. ISBN 0-9519899-2-8. König, Erwin. 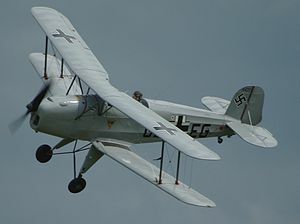 Die Bücker-Flugzeuge (The Bücker Aircraft) (bilingual German/English). Martinsried, Germany: Nara Verlag, 1987. ISBN 3-925671-00-5. Mondey, David. The Hamlyn Concise Guide to Axis Aircraft of World War II. London: Chancellor Press Ltd, 2006. ISBN 1-85152-966-7. Sarjeant, L.F. Bücker Bü 131 Jungmann (Aircraft in Profile 222). Windsor, Berkshire, UK: Profile Publications Ltd., 1971. Smith, J. Richard and Antony L. Kay. German Aircraft of the Second World War. London: Putnam and Company Ltd., 3rd impression 1978, pp. 91–92. ISBN 0-370-00024-2. Wietstruk, Siegfried. Bücker-Flugzeugbau, Die Geschichte eines Flugzeugwerkes (in German). D-82041 Oberhaching, Germany: Aviatik Verlag, 1999. ISBN 3-925505-28-8. Wood, Tony and Bill Gunston. Hitler's Luftwaffe: A Pictorial History and Technical Encyclopedia of Hitler's Air Power in World War II. London: Salamander Books Ltd., 1977, p. 139. ISBN 0-86101-005-1. Wikimedia Commons has media related to Bücker Bü 131. This page was last edited on 22 March 2019, at 09:20 (UTC).